More than 700 chefs, restaurateurs and foodies gathered at the Los Angeles Convention Center on August 27 for the sixth annual Culinary Clash presented by Coca-Cola. 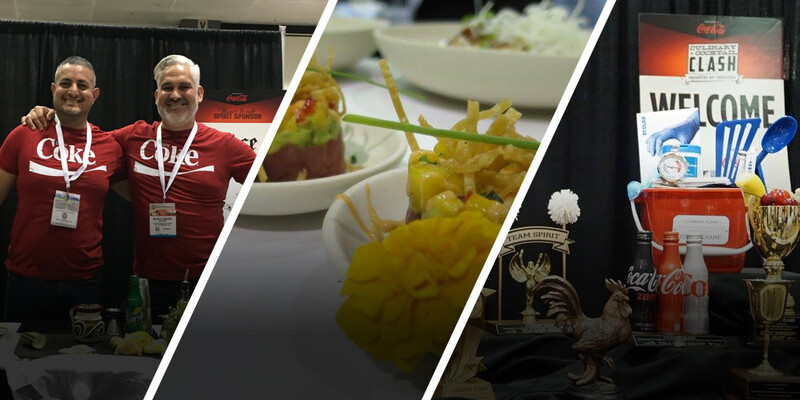 A highlight of the Western Food Expo, the event features teams from the nation’s top restaurant brands competing for bragging rights. This year’s event had a twist: the addition of a craft cocktail competition. West Coast Coca-Cola employees volunteered their time and beverage expertise to serve as judges for the first-time mix-off. Culinary + Cocktail Clash raises money for the California Restaurant Association Foundation’s ProStart program, a two-year career and technical education program focused on culinary arts and restaurant management skills. ProStart participants not only benefitted from the event, but they also got to compete in the cooking portion: Each culinary team comprised a ProStart student, restaurant executive and corporate chef. They had 30 minutes and two butane burners to create an amuse bouche and an entrée. For the cocktail competition, the adult team members were given five minutes to create a signature beverage using Jose Cuervo tequila and at least one Coca-Cola beverage. Black Bear Diner took home top honors (The Purse) in the culinary competition for a Jive Turkey Pop and Rockin’ Ricotta Turkey Roll. Lawry’s The Prime Rib snagged the Jose Cuervo Golden Goblet in the inaugural Cocktail Clash for the Royal Berry, a mix of tequila, Zico® Coconut Water, simple syrup, muddled berries, lemon juice and a dash of Gold Label Prickly Pear. This year’s CRAF Culinary + Cocktail Clash raised more than $100,000 for culinary education. To find out more about the ProStart program, visit the National Restaurant Association Education Foundation website.